Discuss the two types of frontiers and their stages? Also, discuss how successful were government efforts to promote settlement of the Great Plains. Offer examples how government support increased the population on the Great Plains, how it helped the the role of railroads in the economy, and the Homestead Act. Finally identify examples of "primary" and "secondary" frontiers. There'were two types of frontiers; the first was the existed from 1607-1890. Examples are the fur trade, the mining frontier cattle kingdom. industry, Andrew Carnegie's steel industry , and Steve Wozniak and Steve Jobs, the founders of Apple Computers. Within each frontier there are two patterns to be found. First there is the PRIMARY FRONTIER. This is the time period when the individual has a chance to become without investing a lot of money . It takes hard work, self-discipline , thrift, and a willingness to­ participate in the frontier. The primary frontier is generally replaced by the secondary frontier. It took over 250 years—from the first settlement at Jamestown until 1870—to turn 400 million acres of forests and prairies into flourishing farms. Settling the second 400 million acres took only 30 years, from 1870 to 1900. Federal land policy and the completion of transcontinental railroad lines made this rapid settlement possible. As one booster put it, “the West is purely a railroad enterprise.” No economic enterprise rivalled the railroads in scale, scope, or sheer impact. No other businesses had attracted such enormous sums of capital, and no other ventures ever received such lavish government subsidies (business historian Alfred Chandler called the railroads the “first modern business enterprise”).18 By “annihilating time and space”—by connecting the vastness of the continent—the railroads transformed the United States and they made the American West. The railroads boomed. In 1850, there were 9,000 miles of railroads in the United States. In 1900 there were 190,000, including several transcontinental lines.21 To manage these vast networks of freight and passenger lines, companies converged rails at hub cities. Of all the Midwestern and Western cities that blossomed from the bridging of western resources and eastern capital in the late nineteenth century, Chicago was the most spectacular. It grew from 200 inhabitants in 1833 to over a million by 1890. By 1893 it and the region from which it drew were completely transformed. The World’s Columbian Exposition that year trumpeted the city’s progress, and broader technological progress, with typical Gilded Age ostentation. A huge, gleaming (but temporary) “White City” was built in neoclassical style to house all the features of the fair and cater to the needs of the visitors who arrived from all over the world. Highlighted in the title of this world’s fair were the changes that had overtaken North America since Columbus made landfall four centuries earlier. Chicago became the most important western hub, and served as the gateway between the farm and ranch country of the Great Plains and eastern markets. Railroads brought cattle from Texas to Chicago for slaughter, where they were then processed into packaged meats and shipped by refrigerated rail to New York City and other eastern cities. Such hubs became the central nodes in a rapid-transit economy that increasingly spread across the entire continent linking goods and people together in a new national network. 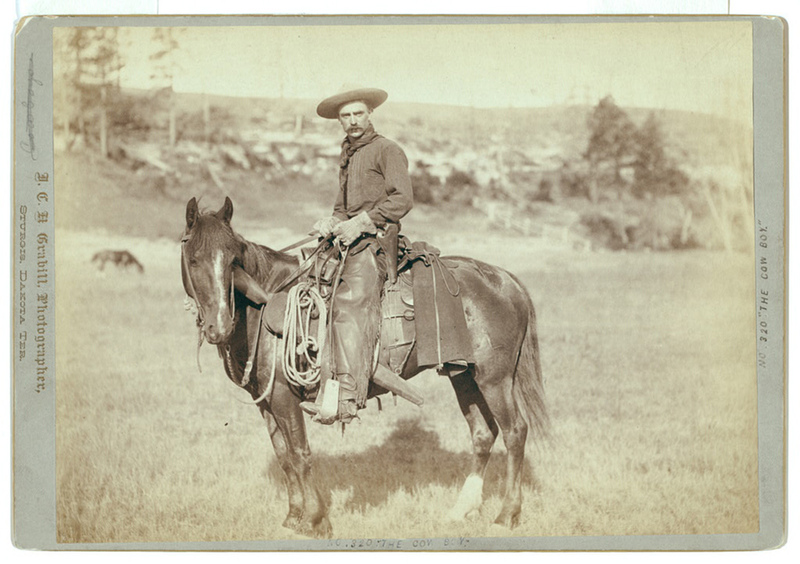 It was this national network that created the fabled cattle drives of the 1860s and 1870s. The first cattle drives across the central Plains began soon after the Civil War. Railroads created the market for ranching, and because for the few years after the war that railroads connected eastern markets with important market hubs such as Chicago, but had yet to reach Texas ranchlands, ranchers began driving cattle north, out of the Lone Star state, to major railroad terminuses in Kansas, Missouri, and Nebraska. Ranchers used well-worn trails, such as the Chisholm Trail, for drives, but conflicts arose with Native Americans in the Indian Territory and farmers in Kansas who disliked the intrusion of large and environmentally destructive herds onto their own hunting, ranching, and farming lands. Other trails, such as the Western Trail, the Goodnight-Loving Trail, and the Shawnee Trail, were therefore blazed. While most cattle drivers were men, there are at least sixteen verifiable accounts of women participating in the drives. Some, like Molly Dyer Goodnight, accompanied their husbands. Others, like Lizzie Johnson Williams, helped drive their own herds. Williams made at least three known trips with her herds up the Chisholm Trail. But if workers of cattle earned low wages, owners and investors could receive riches. At the end of the Civil War, a steer worth $4 in Texas could fetch $40 in Kansas. Although profits slowly levelled off, large profits could still be made. And yet, by the 1880s, the great cattle drives were largely done. The railroads had created them, and the railroads ended them: railroad lines pushed into Texas and made the great drives obsolete. But ranching still brought profits and the Plains were better suited for grazing than for agriculture and western ranchers continued supplying beef for national markets. 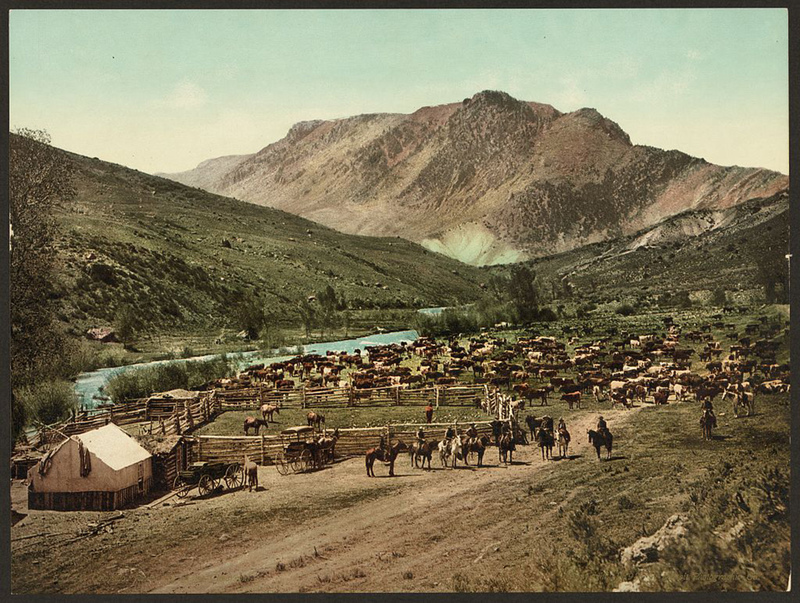 Ranching was just one of many western industries that depended upon the railroads. By linking the Plains with national markets and rapidly moving people and goods, the railroads made the modern American West. Another powerful attraction of the West was the land itself. In 1862, Congress passed the Homestead Act, offering 160 acres of land free to any citizen or intended citizen who was head of the household. From 1862 to 1900, up to 600,000 families took advantage of the government’s offer. Several thousand settlers were exodusters—African Americans who moved from the post-Reconstruction South to Kansas. Despite the massive response by homesteaders, or settlers on this free land, private speculators and railroad and state government agents sometimes used the law for their own gain. Cattlemen fenced open lands, while miners and woodcutters claimed national resources. Only about 10 percent of the land was actually settled by the families for whom it was intended. In addition, not all plots of land were of equal value. Although 160 acres could provide a decent living in the fertile soil of Iowa or Minnesota, settlers on drier Western land required larger plots to make farming worthwhile. Eventually, the government strengthened the Homestead Act and passed more legislation to encourage settlers. In 1889, a major land giveaway in what is now Oklahoma attracted thousands of people. In less than a day, land-hungry settlers claimed 2 million acres in a massive land rush. Some took possession of the land before the government officially declared it open. Because these settlers claimed land sooner than they were supposed to, Oklahoma came to be known as the Sooner State. As settlers gobbled up Western land, Henry D. Washburn and fellow explorer Nathaniel P. Langford asked Congress to help protect the wilderness from settlement. In 1870, Washburn, who was surveying land in northwestern Wyoming, described the area’s geysers and bubbling springs as: “objects new in experience . . . possessing unlimited grandeur and beauty.” In 1872, the government created Yellowstone National Park. Seven years later, the Department of the Interior forced railroads to give up their claim to Western landholdings that were equal in area to New York, New Jersey, Pennsylvania, Delaware, Maryland, and Virginia combined. Even so, by 1880, individuals had bought more than 19 million acres of government-owned land. Ten years later, the Census Bureau declared that the country no longer had a continuous frontier line—the frontier no longer existed. To many, the frontier was what had made America unique. In an 1893 essay entitled “The Significance of the Frontier in American History,” the historian Frederick Jackson Turner agreed. Today many historians question Turner’s view. They think he gave too much importance to the frontier in the nation’s development and in shaping a special American character. The frontier settlers faced extreme hardships—droughts, floods, fires, blizzards, locust plagues, and occasional raids by outlaws and Native Americans. Yet the number of people living west of the Mississippi River grew from 1 percent of the nation’s population in 1850 to almost 30 percent by the turn of the century. Since trees were scarce, most settlers built their homes from the land itself. Many pioneers dug their homes into the sides of ravines or small hills. A stovepipe jutting from the ground was often the only clear sign of such a dugout home. Those who moved to the broad, flat plains often made freestanding houses by stacking blocks of prairie turf. Like a dugout, a sod home, or soddy, was warm in winter and cool in summer. Soddies were small, however, and offered little light or air. They were havens for snakes, insects, and other pests. Although they were fireproof, they leaked continuously when it rained. Virtually alone on the flat, endless prairie, homesteaders had to be almost superhumanly self-sufficient. Women often worked beside the men in the fields, plowing the land and planting and harvesting the predominant crop, wheat. They sheared the sheep and carded wool to make clothes for their families. They hauled water from wells that they had helped to dig, and made soap and candles from tallow. At harvest time, they canned fruits and vegetables. They were skilled in doctoring—from snakebites to crushed limbs. Women also sponsored schools and churches in an effort to build strong communities. Establishing a homestead was challenging. Once accomplished, it was farming the prairie, year in and year out, that became an overwhelming task. In 1837, John Deere had invented a steel plow that could slice through heavy soil. In 1847, Cyrus McCormick began to mass-produce a reaping machine. But a mass market for these devices didn’t fully develop until the late 1800s with the migration of farmers onto the plains. Other new and improved devices made farm work speedier—the spring-tooth harrow to prepare the soil (1869), the grain drill to plant the seed (1841), barbed wire to fence the land (1874), and the corn binder (1878). Then came a reaper that could cut and thresh wheat in one pass. By 1890, there were more than 900 manufacturers of farm equipment. In 1830, producing a bushel of grain took about 183 minutes. By 1900, with the use of these machines, it took only 10 minutes. These inventions made more grain available for a wider market. Elaborate machinery was expensive, and farmers often had to borrow money to buy it. When prices for wheat were higher, farmers could usually repay their loans. When wheat prices fell, however, farmers needed to raise more crops to make ends meet. This situation gave rise to a new type of farming in the late 1870s. Railroad companies and investors created bonanza farms, enormous single-crop spreads of 15,000–50,000 acres. The Cass-CheneyDalrymple farm near Cassleton, North Dakota, for example, covered 24 square miles. By 1900, the average farmer had nearly 150 acres under cultivation. Some farmers mortgaged their land to buy more property, and as farms grew bigger, so did farmers’ debts. Between 1885 and 1890, much of the plains experienced drought, and the large single-crop operations couldn’t compete with smaller farms, which could be more flexible in the crops they grew. The bonanza farms slowly folded into bankruptcy. Farmers also felt pressure from the rising cost of shipping grain. Railroads charged Western farmers a higher fee than they did farmers in the East. Also, the railroads sometimes charged more for short hauls, for which there was no competing transportation, than for long hauls. The railroads claimed that they were merely doing business, but farmers resented being taken advantage of. “No other system of taxation has borne as heavily on the people as those extortions and inequalities of railroad charges” wrote Henry Demarest Lloyd in an article in the March 1881 edition of Atlantic Monthly. Many farmers found themselves growing as much grain as they could grow, on as much land as they could acquire, which resulted in going further into debt. But they were not defeated by these conditions. Instead, these challenging conditions drew farmers together in a common cause.